As far as intellectuality and cognition are concerned, so-called ‘knowledge workers’ play key roles in modern enterprises. For knowledge workers, contributing to a successful business by forming and implementing their concepts is often considered a lifelong task. As analysts have predicted an increasing skills shortage for years to come, companies are trying their best to counteract any adverse effects. The ‘war for talent’ entails new ways of finding and keeping the necessary talent for company plans. Realistic views reveal disappointment as to the actual timespan for which knowledge workers dedicate themselves to challenging brainteasers. Most of their daily work routine is spent occupied with media disruption and bridging the gap between system boundaries found in the main process. For a representative example, let’s use transactions. On a daily basis, transactions are processed via diverse communication channels while employees manually move specific data back and forth. This happens on both a large-scale basis (transmitting orders from ERP into the main customer data system) and a small-scale basis (typing email contents into CRM). Knowledge workers often compensate for mistakes that are caused by system changes. Staff working in administration and back offices hardly ever co-operate in linked processes with machines. This is unnecessary, as companies could have their daily routine operations executed automatically. Instead, skilled personnel are spending time and energy exchanging data from one computer to the next. Input management is one of the most affected divisions, as field data found in documents and emails have to be converted into applicable operating sequences. 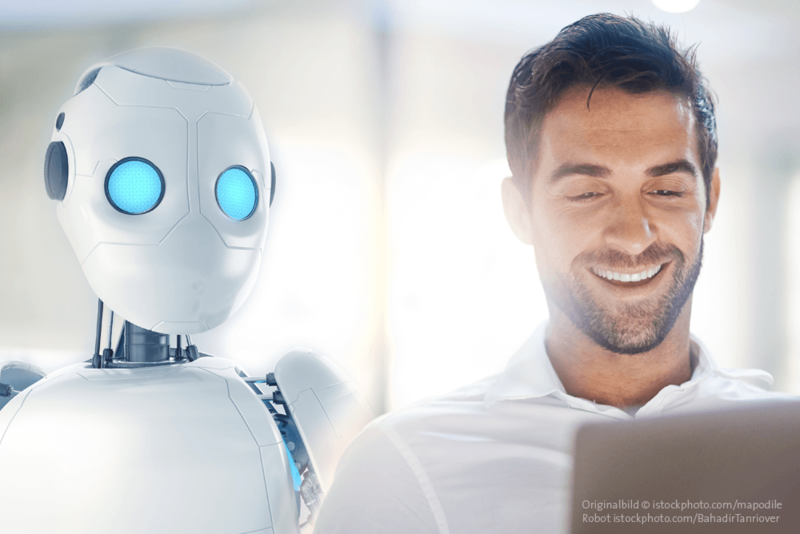 In this case, the possible combination of RPA (robotic process automation) and AI (artificial intelligence) software provides new opportunities for trend-setting human-computer interactions. Many people think that integrating “robots” into their company’s system environment is an elaborate process. Far from it! RPA simply requires login credentials, a password and a user interface to intervene in the control sequences. Robotic process automation does not require any programming (at least not as long as companies start customizing it as well). Put differently, for the advanced IT-connoisseurs amongst you, RPA exerts influence on the presentation level of all your existing portfolios and applications. In corporate praxis, this “virtual agent” has the ability to complete the daily work of up to five human employees regarding copying and pasting contents from the left system into the right one. Thanks to two specific developments, robotic process automation is being considered as a key solution for cross-linking information systems with service procedures. An increase in the centralized execution of key procedures (i.e. by outsourcing company personnel/BPO) increases the transactional quality and often leads to RPA-projects generating a return on investment (ROI) within just a few months. An example? On a weekly basis, a large energy provider automatically transfers more than 20,000 correspondence cases into a Siebel CRM for further processing – 9 out of 10 times without any human intervention. 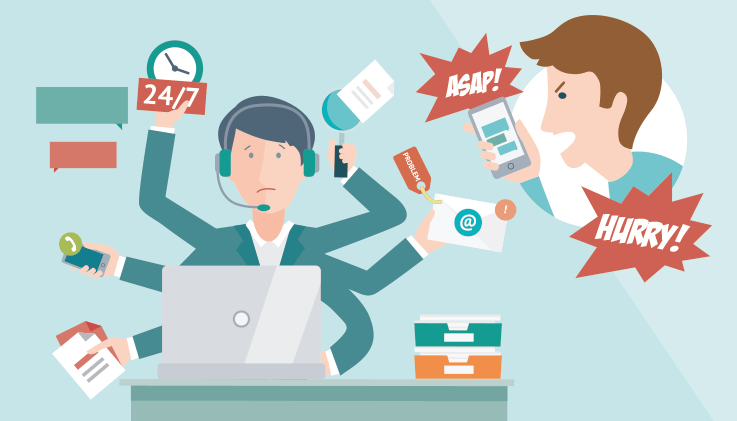 Similarly, workers can put all their effort into content-related real-time service and do not have to set their hands to routine business tasks. RPA alone automatically carries out rule-based activities between application boundaries. But what happens when combining RPA with AI software? Only then RPA is able to operate in unregulated domains and process unstructured data. It is found everywhere: in customer-related correspondence such as claims, but also in certificates, facsimiles, emails, chats or social networks. Adaptive artificial intelligence is able to acquire knowledge from employee behavior towards business-related matters, such as evaluating and transmitting relevant data. In this way, a symbiosis between human beings and robots can emerge. According to experience reports, users report that combined solutions process customer demands much faster and with significantly lower costs while ensuring improved service and compliance. This affects the business model of BPOs (business process outsourcing). Once routine work patterns are automatically processed by RPA und AI, all organized “temporary work” lapses – a fact that will ultimately benefit skilled employees.